Septoria leaf and fruit spot, caused by the fungus Septoria cucurbitacearum, can be an important disease of certain cucurbits grown in the Northeast and Midwest. The fungus can infect the leaves of muskmelon, pumpkin, summer and winter squash (butternut, acorn, and processing "pumpkins" [actually squash]), and gourds and the fruit of pumpkin, butternut, acorn, and processing "pumpkins." Although affected fruit are unlikely to rot in storage or to cause other fruit to rot, they may be unmarketable because of the raised white spots caused by the disease. The disease has occurred in New York since the early 1900s. Symptoms of Septoria leaf spot are similar on all the cucurbits infected. The spots are very apparent on muskmelon and butternut squash leaves (figs. 1, 2), but are also identifiable on other cucurbits. Spots are normally circular or occasionally irregular, beige to nearly white in color, measuring 1 to 2 mm in diameter or occasionally larger on the upper leaf surface. A narrow brown border surrounds the spot and, with age, the lesion may crack. When the disease first appears in the spring under moist conditions, the spots appear with or without a white speck surrounded by a much larger brown water-soaked border, giving the appearance of a different disease. The distinguishing sign on older spots is the presence of small, black, specklike fruiting bodies called pycnidia embedded within the tissue (fig. 3). Not all spots will contain pycnidia, but some may contain up to eight or more. The black specks can be seen with an unaided eye. Under moist conditions, long, thin, needlelike conidia are released. 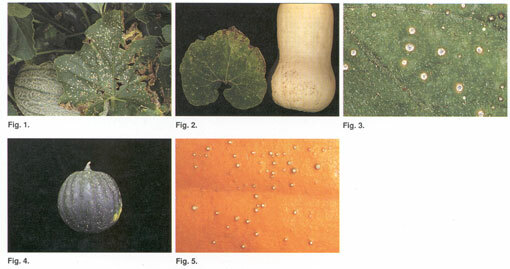 Small (1 to 2 mm) erumpent whitish spots appear as a rash on the surface of infected butternut, acorn, and pumpkin fruit (figs. 2, 4, 5). Pycnidia of Septoria are not often found on these whitish spots, but other organisms including cucurbit anthracnose (Colletotrichum orbiculare) and anthracnose/black dot (Colletotrichum coccodes) sometimes invade these lesions. Unless other diseases such as anthracnose or gummy stem blight are involved in fruit infection, fruit rots caused by Septoria are not likely to occur. Growers who have tried to market fruit with the small white speckles have had some of their produce rejected. Limited information is available on the etiology of this disease, but conditions that favor its development are probably not unlike those of Septoria species that infect crops such as tomato and celery. The fungus successfully overwinters in New York on infected crop debris because the disease recurs in several areas of the state in succeeding years. The fungus most likely survives as dormant mycelium or as chlamydospores (thick-walled modifications of the mycelium). In the spring pycnidia are produced, which give rise to conidia that serve as the primary inoculum. The conidia are expelled in long mucilaginous tendrils, are also referred to as spore horns. The needle-shaped conidia are readily disseminated by splashing or wind-borne rain. In the spring, high humidity and rainfall and temperatures between 61 and 66° F are ideal for infection and further disease development. If ideal weather conditions persist, the organism can produce additional inoculum and infections in repeated secondary cycles. Although disease development slows with warmer summer temperatures and lack of rainfall, recurrence in the fall is likely unless early controls are practiced. It is not known when fruit infection occurs, but it is likely to be in the early stages of development before the outer rind becomes fully mature. Infected fruit can be found in the field before the fall harvest. Because the organism can survive on infected crop debris, growers should follow a minimum 2-year rotation out of all cucurbits. To speed decay of plant debris, crop refuse should be plowed under as soon as possible after harvest. If cool and moist conditions persist into June, lesions will probably appear. Scouting at this time would allow for early detection and the scheduling of protectant fungicides to prevent further disease spread. Early control may preclude the need for additional sprays in the fall.